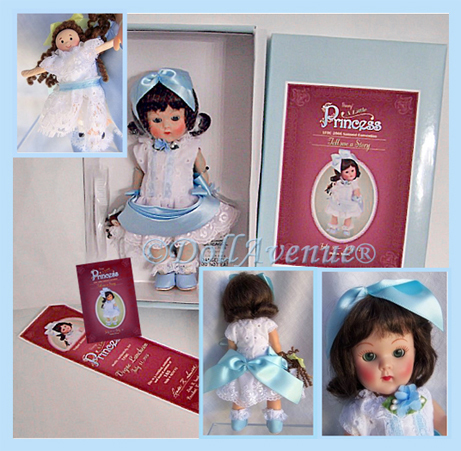 RARE LE Ginny "A Little Princess"
Catalog > RARE LE Ginny "A Little Princess"
UFDC Vogue Ginny "A Little Princess" is a Limited Edition of 165 pieces and is an extremely rare. This Vintage Reproduction Ginny is from an event entitled Tell Me a Story during the 2006 UFDC convention held in Dallas TX. A Little Princess Ginny, is dressed in a Victorian style white dress trimmed with lace and blue satin ribbons. She has a blue satin bow in her hair, and her little companion is a sweet little matching doll with long braids. This doll is unique in the fact that the Certificate of Authenticity (COA) is in the shape of a colored bookmark and matches the lid of the box which shows a color photo of Ginny, the title and the convention dates. She also comes with a bonus - a miniature book of the story, which has pictures and the story in it! This pre-owned doll is in excellent, minty condition (was removed from box previously), She will arrive in her original box with all described above.